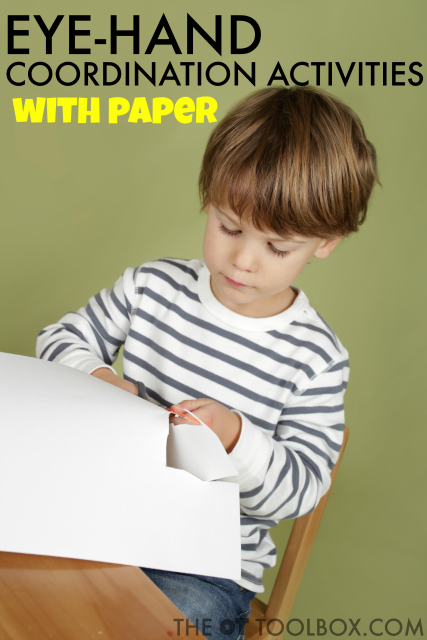 Paper is something that most parents, teachers, and therapists have easy access to. It's usually pretty plentiful even if it is sourced from the recycling bin. Whether it's a roll of easel paper, a packet of construction paper, or yesterday's newspaper, most of us have paper of some kind sitting around the house. And for teachers, lined paper is one of those supplies that are typically provided by the classroom. So, it makes sense to use paper for a tool that provides way more therapeutic benefit than it seems a simple stack of paper can provide. 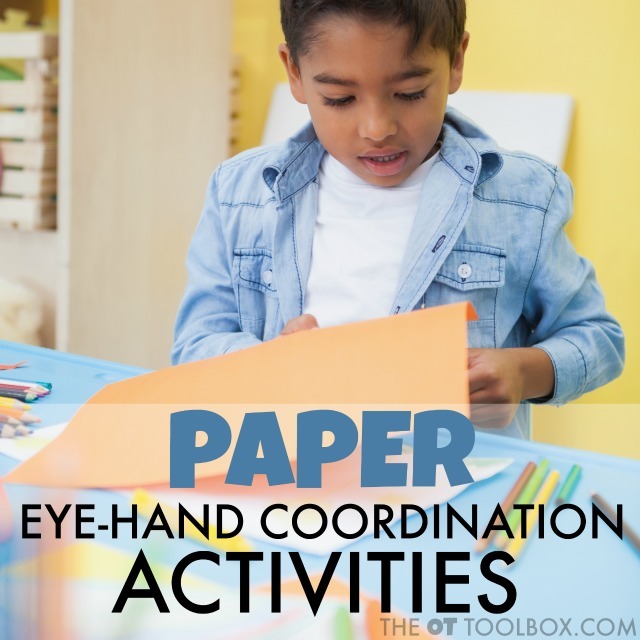 These easy eye-hand coordination activities use paper to develop fine motor skills and visual motor integration so that kids can carry over these necessary skills to tasks such as cutting with scissors, handwriting, fine motor tasks, and self- care tasks like clothing fasteners or shoe tying. 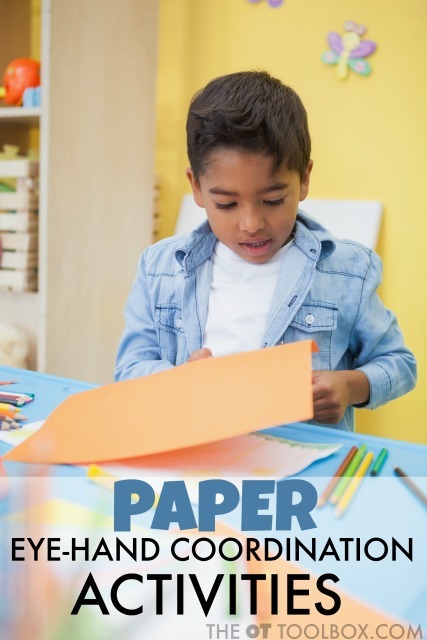 Grab a stack of paper of any kind and use it in therapy or home programs to work on the visual motor integration skills needed for many functional tasks. You'll need paper of any size and any variety to complete these activities. Use what you have available or plan ahead when preparing visual motor activities for the classroom, therapy plans, or home programs. So, looking at the list above, grab the nearest type of paper and get the kids busy with super easy activities that are easily able to promote eye-hand coordination development. Eye-hand coordination takes the visual information as it is processed by the eye and brain and coordinates motor movements in an appropriate and efficient manner to perform functional tasks. Eye-hand coordination is also known as visual motor integration and is essential for most functional activities. Make paper dolls- Cut, fold, and decorate paper people of all kinds. Create paper chains- Make a pattern and string it across a room. Make and cut paper snowflakes- Make it creative by folding and cutting paper towel snowflakes or cupcake liner snowflakes, too. Fold paper airplanes. Then try to fly it into a target. Throw paper snowballs into a basket. Move back farther and add in obstacle course types of motor movements. Fold origami- Follow step-by-step instructions in a how-to book. Make paper helicopters- Fly them from a high space such as a step stool and try to drop them into a target. Make coin rubbings- Trace other items such as leaves, paper clips, or keys. Make a paper fortune teller- Add educational aspects such as math facts or definitions. Fold paper footballs- Make it educational by adding math concepts or sight word practice. Make paper boats. Try to see how far they can float with added weight. Play paper and pencil games such as tic tac toe, dots-and-boxes, or other paper and pencil games (Simple Play Ideas). Scrunch paper into small pieces and glue them onto artwork. Tear paper in long strips- Tear long strips or simple shapes. All of these activities are simple to set up and require little preparation work. Use this list as a backup activity list for those times when kids need something to do between lessons in the classroom, or a rainy day activity. Some of these paper activities would be great for when waiting in a restaurant. 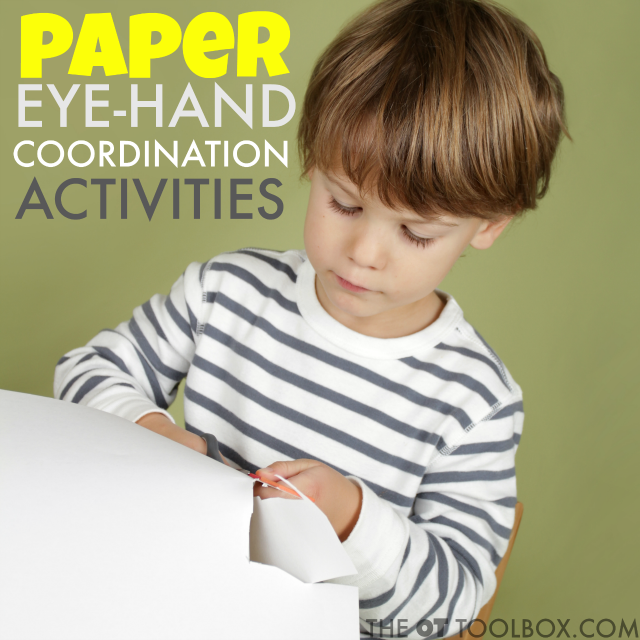 Use the down time to build eye-hand coordination skills with paper! Look here for more ways to develop visual motor integration skills?